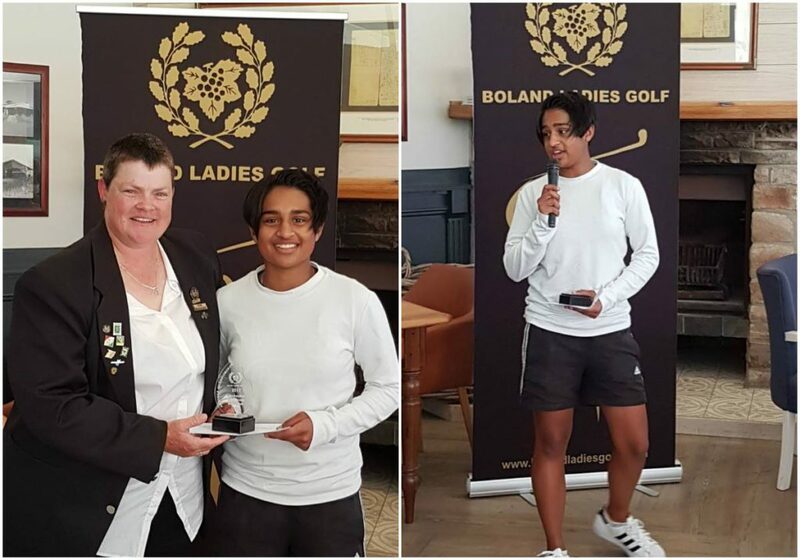 South Africa’s top ranked senior Kajal Mistry was simply majestic as she cruised to an eight shot victory in the Boland Ladies Amateur Championship at Hermanus Golf Club on Sunday, 17 September 2017. The 16-year-old Gauteng golfer fired three birdies in the first round to race to the top of the pile with and opening two-under-par 70. Heading into the final round, she led by two shots from local favourite Lynne Behagg, Kaylah Williams from Western Province, Chloe Royston from KwaZulu-Natal and reigning Nomads Girls SA Rose Bowl champion Kaiyuree Moodley from Gauteng. The quartet tried to close the gap in the final round, but Mistry was untouchable. She overcame a bogey start with a birdie at the second and reversed another drop at six with a birdie at nine to turn level par. After a birdie at 10, she racked up further gains at 13, 17 and 18 to seal her fourth victory this season with a stunning 68. Moodley and Williams closed with rounds of even-par 72 to tie for second on two over and Gauteng’s Symone Henriques shot to fourth at four under with a final round 70. The runaway victory followed Mistry’s previous visits to the winner’s circle this season in the Sanlam SA Women’s Stroke Play, the Western Province Women’s Amateur Match Play and the ProShop 36-hole Championships. The GolfRSA Elite Squad player put her success down to great ball-striking and a hot putter. “It rained throughout the first round, which made it a bit tougher to score, but the weather was perfect with just a little wind to make things tricky in the final round,” said Mistry. “I was striking the ball really well over both days and I only missed five greens in 36 holes. And the putter also came to the party. Mistry enjoyed a steady rise in the rankings last year with a fistful of top five finishes, but a provincial breakthrough in the Ekurhuleni Championship in September kick-started the purple patch that catapulted her to number one. Over the next two months, the GolfRSA Elite Squad player won the Boland Championship, finished fifth in the 8th Albatross International Golf Championship in India and captured a two shot victory in the Mpumalanga Open to finish the season at the top of the senior standings. Although fellow Gauteng and number two ranked Woo-Ju Son has been piling on the pressure this season with four victories and a string of top five finishes, Mistry has not budged from the number one spot. She collected the silverware in the Sanlam SA Women’s Stroke Play, Western Province Women’s Amateur Match Play and the ProShop Gauteng 36-Hole Championships and protected the pole position with a further eight top five finishes in her 14 starts this season. On the international stage, Mistry led the SA team to victory in the All-Africa Junior Golf Championship in Zimbabwe and she was the top point scorer for SA in the Girls Competition at the Junior Golf World Cup in Japan, helping to team to sixth overall. Since Mistry won the 2017 Emerging Athlete category at the annual g-sport SA Women’s Sports Awards in August, the teenager has formulated some clear goals for her future, including a few more victories this season. The Bryanston resident said the runaway victory in Hermanus is just the start of big things to come. “I want to finish the season at the top of the senior and junior rankings,” said Mistry. “I was bitterly disappointed when the Spirit International was cancelled due to Hurricane Irma, but it was for all the right reasons. So now I’ve shifted my goals. “In 2018, I am going all out to win the Sanlam SA Women’s Match Play title, the Nomads SA Girls Rose Bowl and Nomads SA Girls Championship, which gets you into the Duke of York Young Champions Trophy against the best juniors in the world. “My international goals are to qualify for the Junior Golf World Cup team again and to make the Espirito Santo team for the World Amateur Team Championships in Ireland next year.